Since our time in Ghana, something that has always brought us great joy has been to work with young people. They really are the future of the Lord's church and are the hope of tomorrow. One of the things that we liked about the new house we've entered is the larger living room. Last Sunday, we put it to good use, with about twenty-five young people coming out for an evening of singing, prayers, Bible study and fun. I taught some new songs, putting the words up on our living room TV. The young people really enjoyed learning the new songs... they love to sing here. We had some snacks- koolaid, chips and crackers and tuna salad. Everyone really enjoyed the food, both physical and spiritual. Our living room is about twice as big as our old living room... the better to fit MORE young people. I taught about purpose... to illustrate, I blindfolded one of the guys and asked him to throw a ball of paper at a target that was moving. Of course he didn't hit it- the point: if we don't have a clear idea of our purpose on earth, we can never succeed in achieving it. We must have our eyes fixed on our goal. Jonathan helping daddy teach, he he. Andy, one of the promising young men in the church of Christ here. He's a big encouragement. After lessons, we had a game time. "Do you love your neighbor?" is a fun game that had people smiling. Todd, one of our neighbors and a gym member as well, and some of the young ladies, having a great time watching the game. When the question "Do you love your neighbor?" is posed, the person asked must respond with either "No" and their neighbors must switch seats, or "Yes, but..." and then say "but I don't like it when people wear red," or something like this... at which point everyone wearing red must find a new seat. It was a blast, as was all of our youth night. We thank God for the facilities and opportunity to reach out and encourage these young folks. Hello, it is me, George Owusu again. After sharing about my long journey from Ghana, West Africa to Cameroon in Central Africa, I am about to share with you my amazing experiences and the change of culture that I've been able to see, by the grace of God. Before I ever stepped out of my comfort zone, I had the notion that every African country is typically the same or identical. But wait , this was just a long held idea I have had. It is true that most of the various cultures and ways of life may be the same in some ways but many things may vary such as foods, topography, language, fashion, various occupations, music and education and culture as a whole. The first difference I've noticed here are the languages spoken in Cameroon both the tribal and official languages.Truly, Cameroon is extensively diverse compared to Ghana in terms of languages and the number of tribes. Statistically, there are over 200 tribal languages in Cameroon as compared to about 50 tribal languages in Ghana. In Cameroon, there are two official languages, French and English with French dominating. In addition, there is also Pidgin English spoke. What encourages me to learn other languages is that the average person you meet can speaks about four languages. 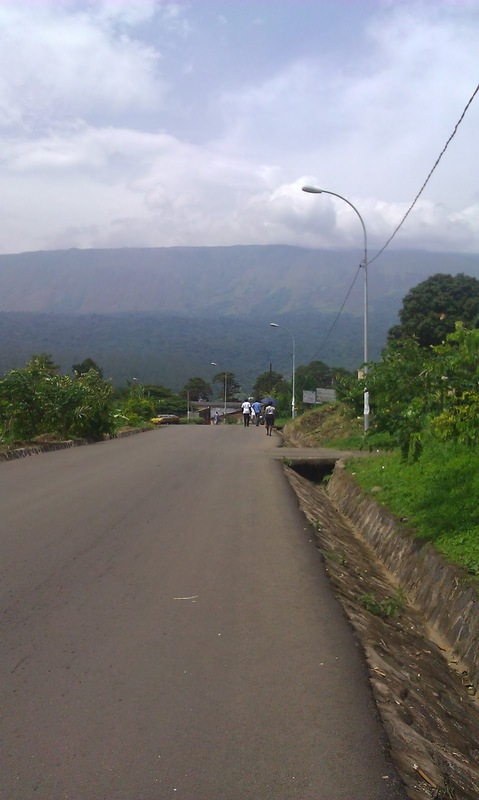 This is what the weather in Buea looks like. Transport in Cameroon is very interesting and different. 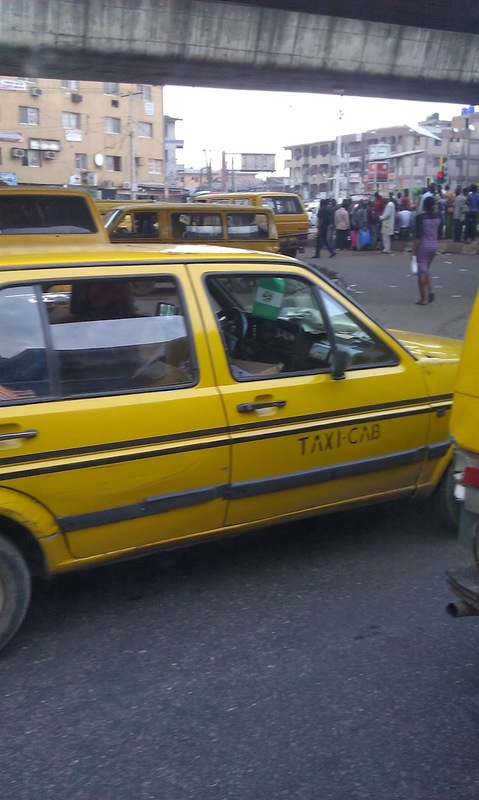 These taxis take six passengers including the driver. I was very surprised the first time I saw that. In some parts of the country, it is common for houses to be made out of wood. It is called a "carraboat" house. This is very common around the mountain. 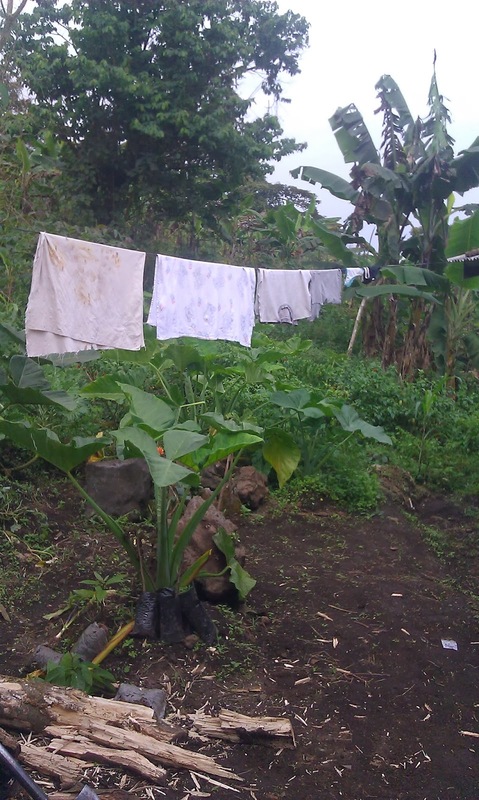 Another difference from Ghana is that Cameroon has a lot of very fertile soil which allows them to do a lot of farming. This is a farm behind someones house. One of the shocking things I have seen in Cameroon which is different from what you will see in Ghana is the graves in people's houses. This is practiced due to some sentimental reasons.There are a lot of houses that have a grave in the yard, something you would never see in Ghana. 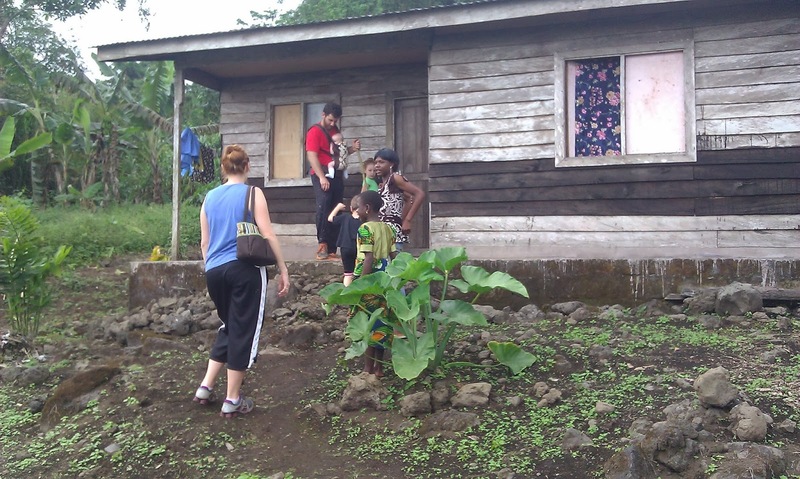 Going around to different villages teaching, preaching, and helping those who are in need is a big part of our ministry. We usually rotate a different congregation each month to teach and preach and share. 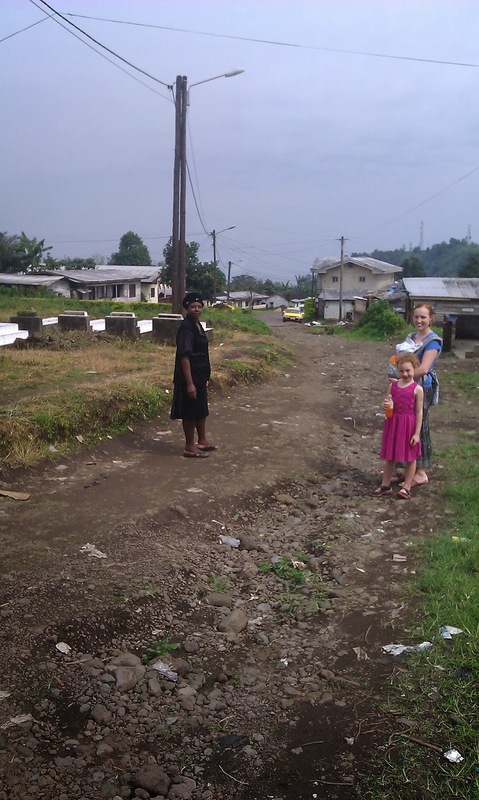 Muea is one of the villages near Buea that God has opened up a door for us to minister in. We are so thankful for the opportunities He has given us and the team work we've had to get things done. This month Jeremiah taught through parts of Ephesians. Here he is speaking about walking in a manner worthy of God's calling taken from Ephesians 4. He offered to pay $20 if someone would cut their pinkie off--- a week's salary in Cameroon. No one took him up on the offer. The point- every part of our body is precious to us... what about the body of Christ? Which part would we cut off? George has done a good job leading the Giving and Lord's Supper devotions even though he is often asked on the spot. Thankfully, Jeremiah gave him a heads up that this might happen. I LOVE teaching the Children's Sunday School class! Each time more and more children come so that "The room don flop for small pikin weh" or "The room overflows with little children." This month I taught the children the OT books of the Bible as well as different Bible stories. Those that could sing all the Old Testament books by the end of the month got a special treat. This is Ashley, from Muea. As you can see she needs reconstructive surgery on her arm and neck. Many Cameroonians cook outside on a wooden fire. Ashley was outside running around playing with other children when her arm fell into a pot of boiling water. We will write more about Ashley once we find out more information about what exactly needs to be done to help her. Few hospitals have the capability of treating her- please pray we can find the right people to help this little girl be able to use her arm again and for us to be able to show the love of God to her and her family.